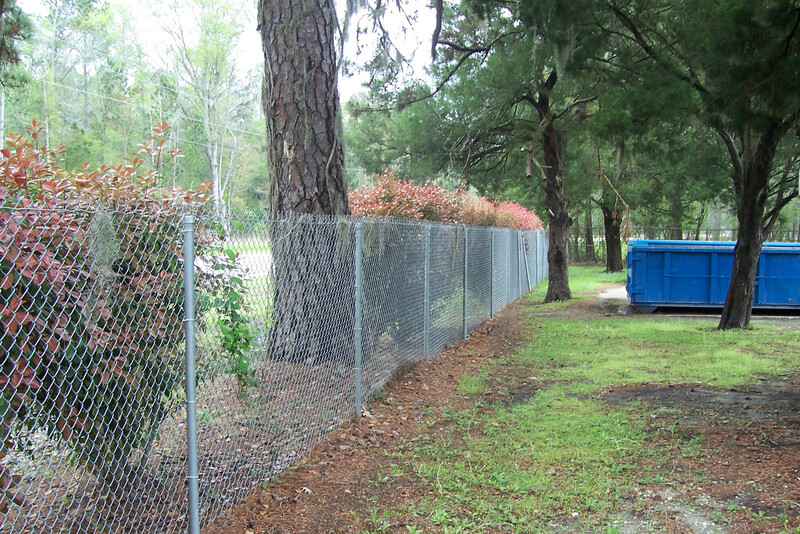 If you are looking for an added privacy for your fenced in location, add some windscreen. There are different percentages of density of screens to choose from – 50% to 100%. 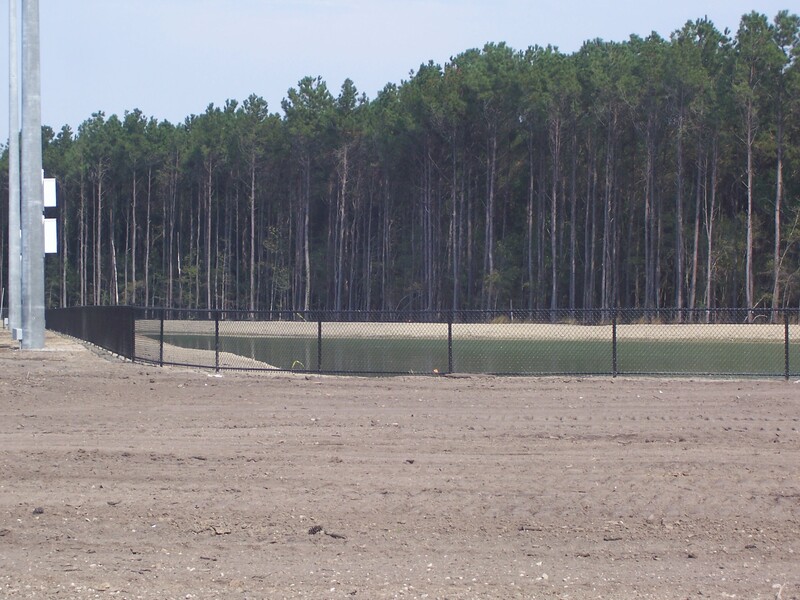 This is a picture of Active Park in Mt Pleasant when the ball fields and retention pond were under construction. 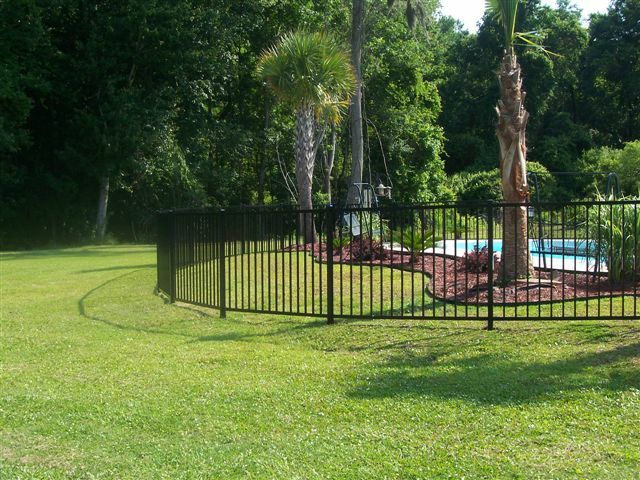 Showing a 4’ high black vinyl coated chain link fence around the retention pond and then the 15’ high Ball field fence. 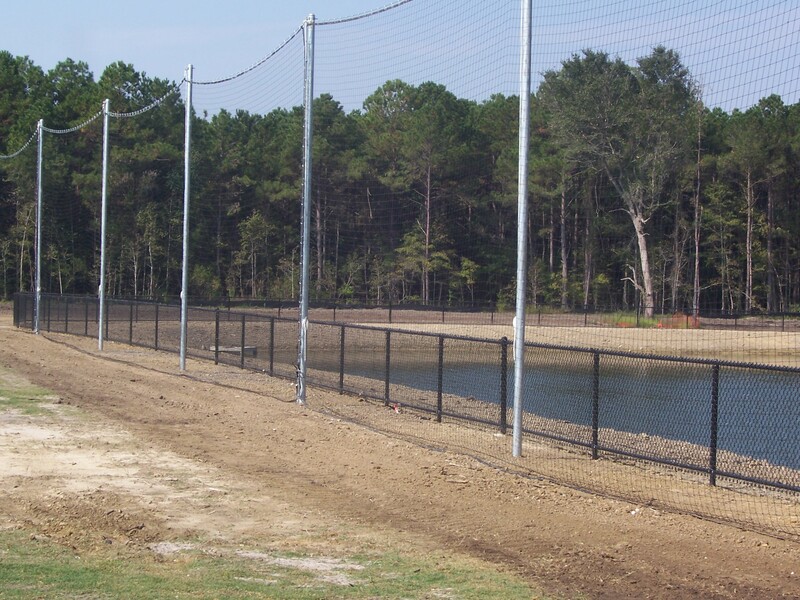 AAA Fence worked in concert with the General Contractor to ensure both the soccer and baseball fields at Active Park, Mt. Pleasant would be well protected from stray balls. 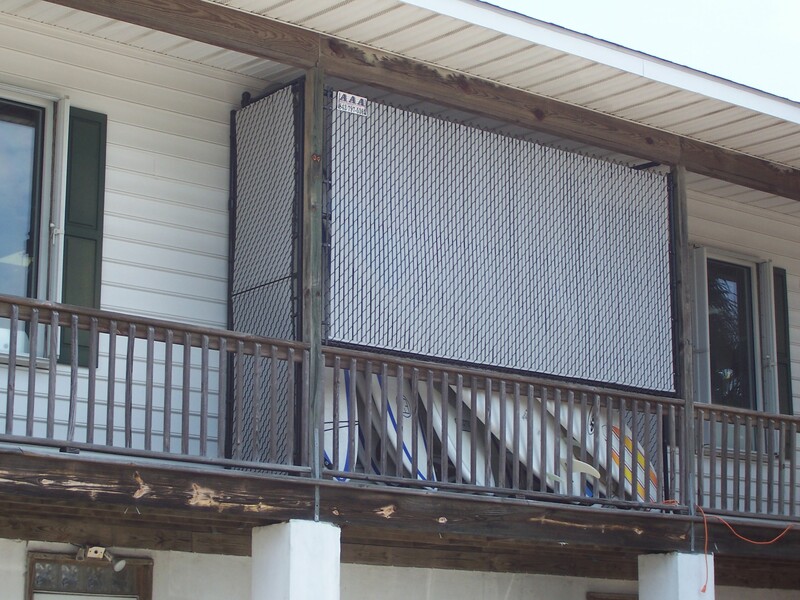 AAA Fence installed this chain link enclosure on the second floor of a popular surf shop adding slats for added security and privacy. 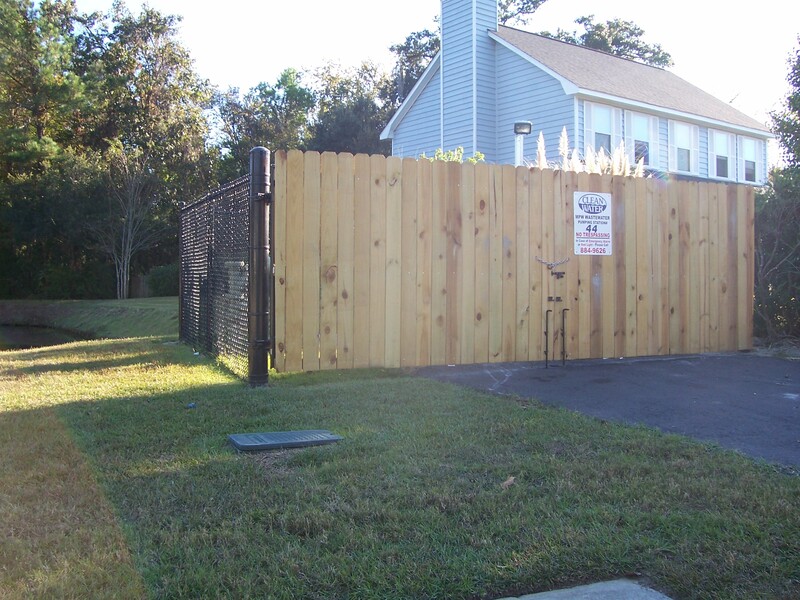 This install was done for the Mt Pleasant Water works for one of their many pump stations…it shows a mixture of a 6’ tall black vinyl coated chainlink fence on the sides and a double drive wood gate for added security on the front. 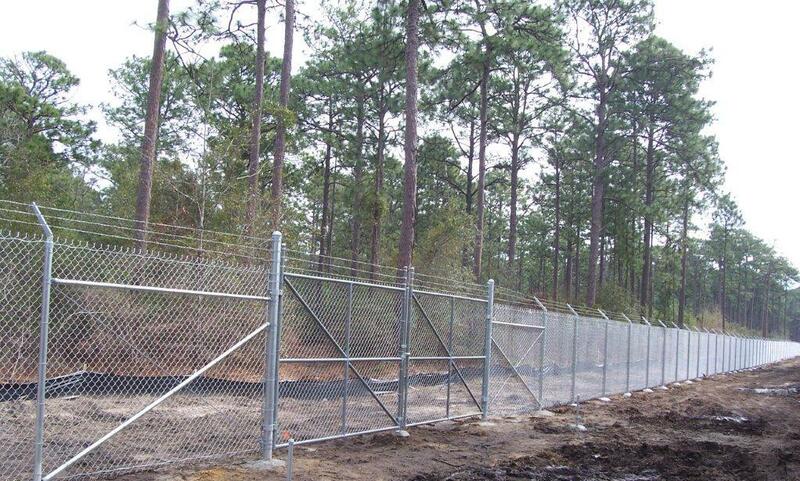 AAA Fence offers temporary construction fence for all your safety and OSHA compliant needs. 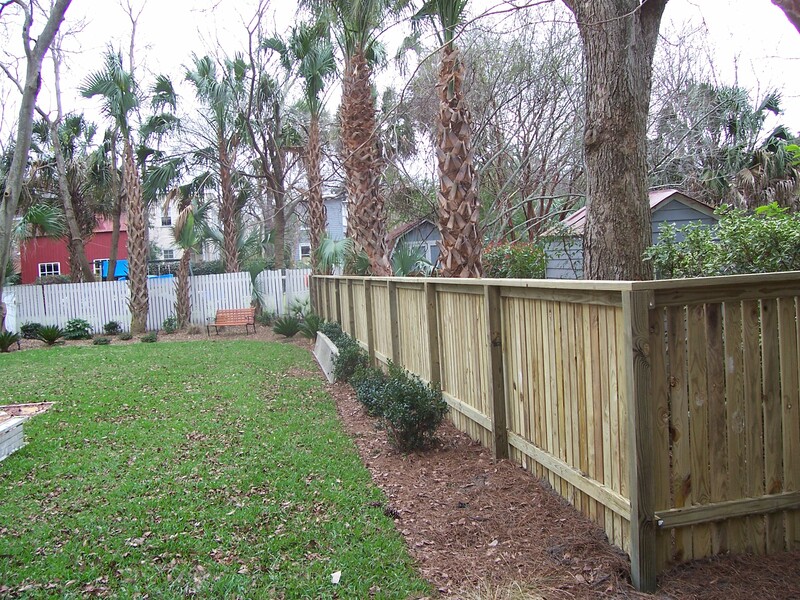 We will install the fence on your site and give you a rental price for the duration of your project. 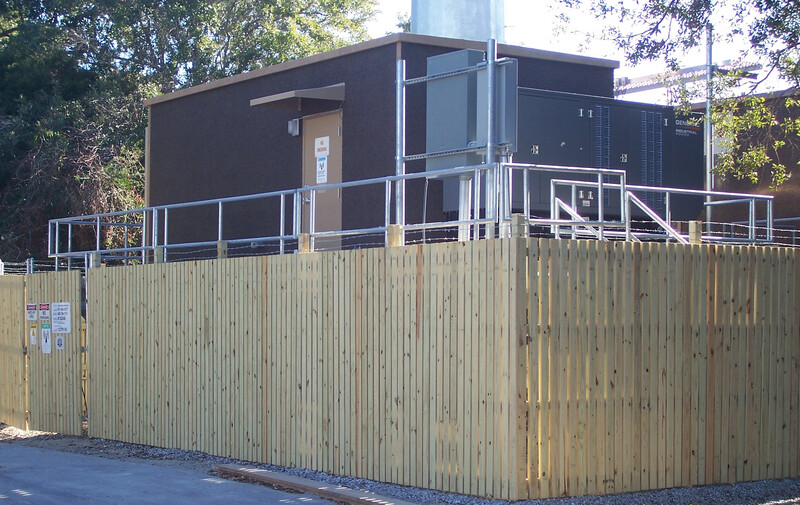 This fence enclosure is downtown Charleston around an electrical sub plant. 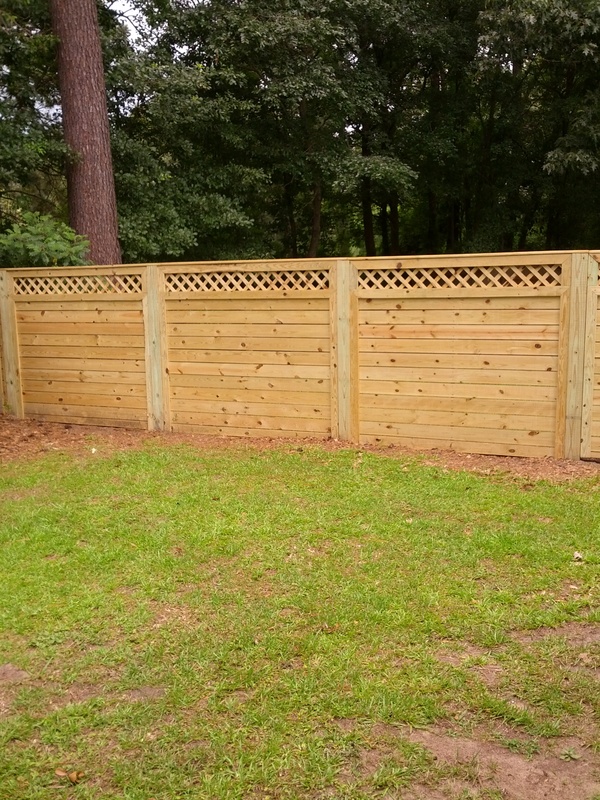 The 6’ wood fence gives it the privacy our customer wanted along with the 2 strands of barb wire at the top to stop any intruders. 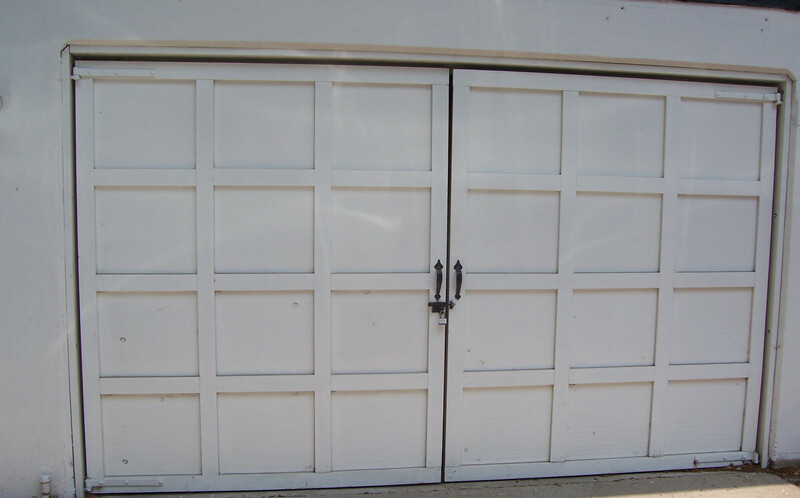 A new tenant moved into one of the older buildings on the Old Navy Base and wanted a secure Double Drive swing out garage door. 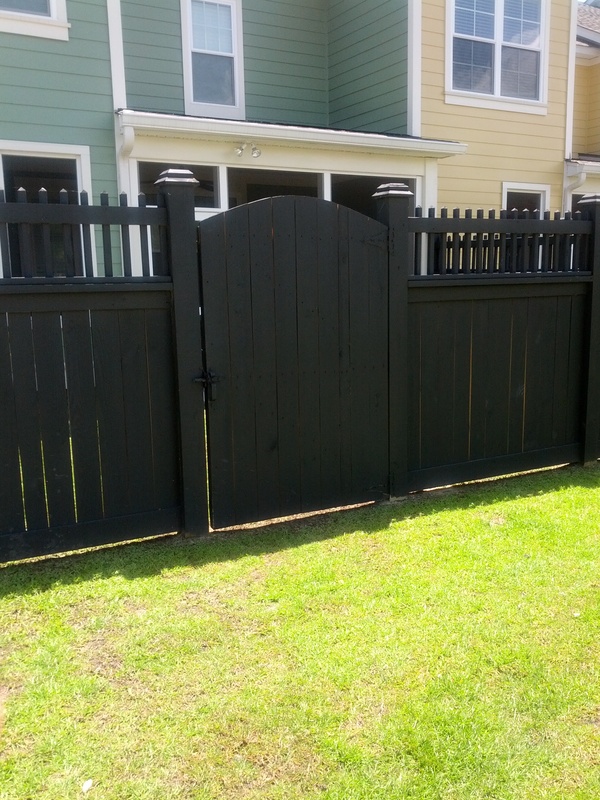 We framed the opening, built the doors and then added the decorative touches our customer wanted. 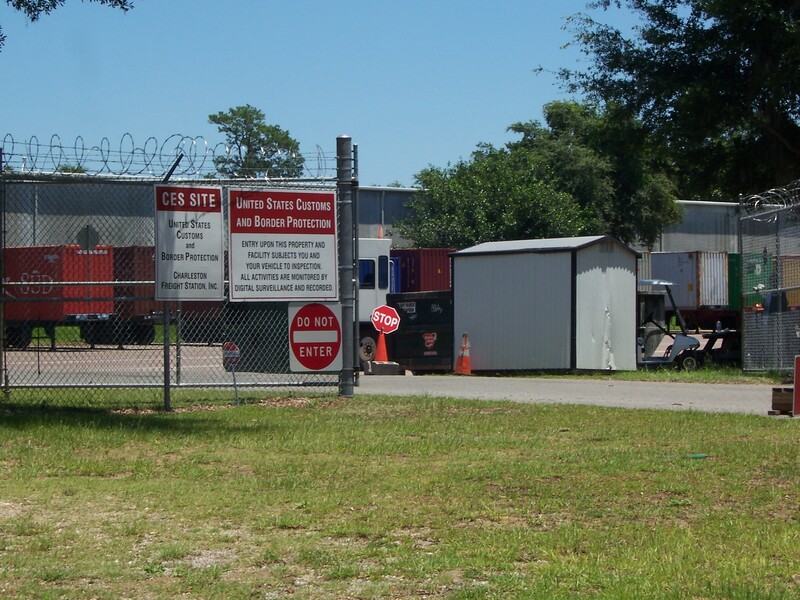 How many times have your servicemen been locked out of your facility due to a co-occupant improperly replacing the order of locks on a chain? 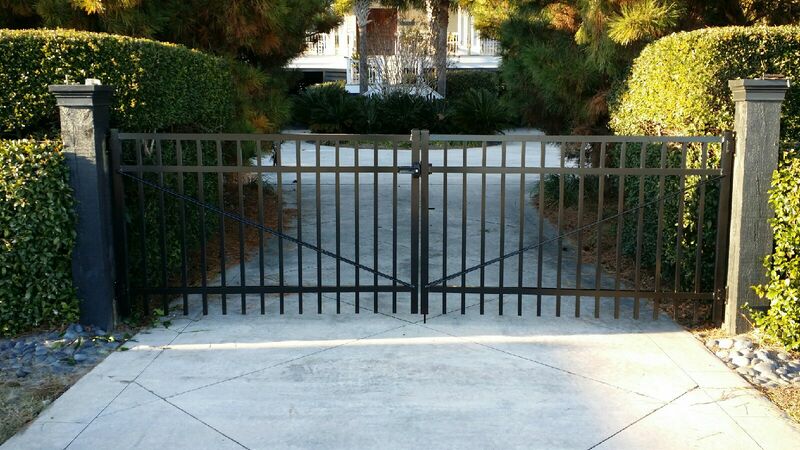 The stymie lock allows all occupants to put their own lock on the gate but cannot lock you out. 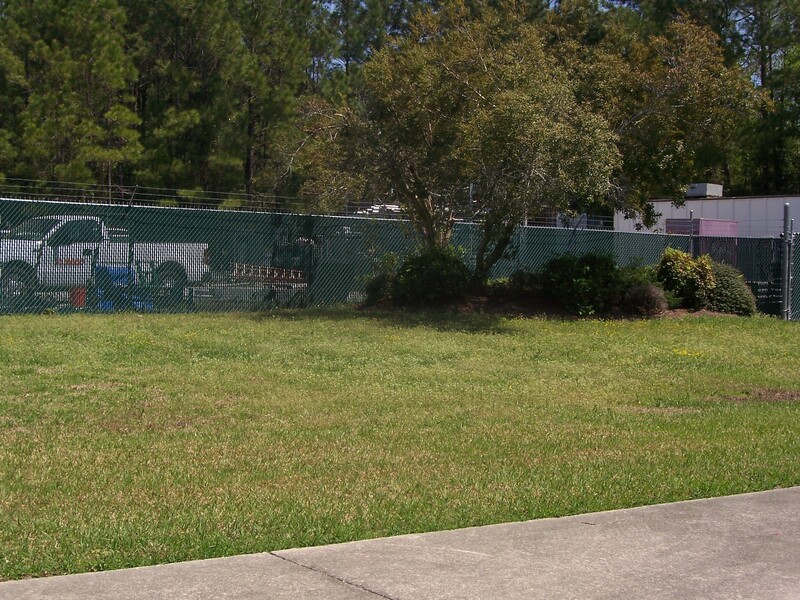 This pictures shows a chain link fence installed on the retaining wall surrounding the Kohl’s department store. 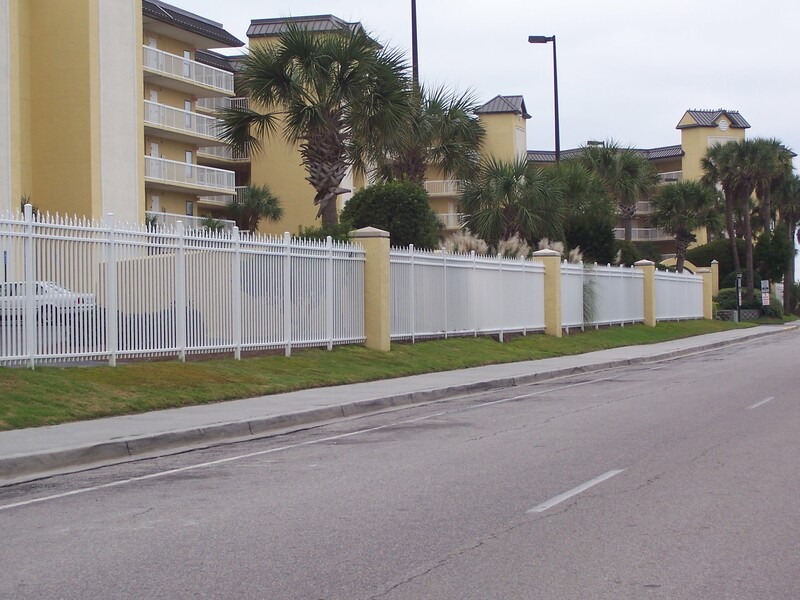 Note also the heavy duty bollards to protect the curbing and wall from large trucks backing up. 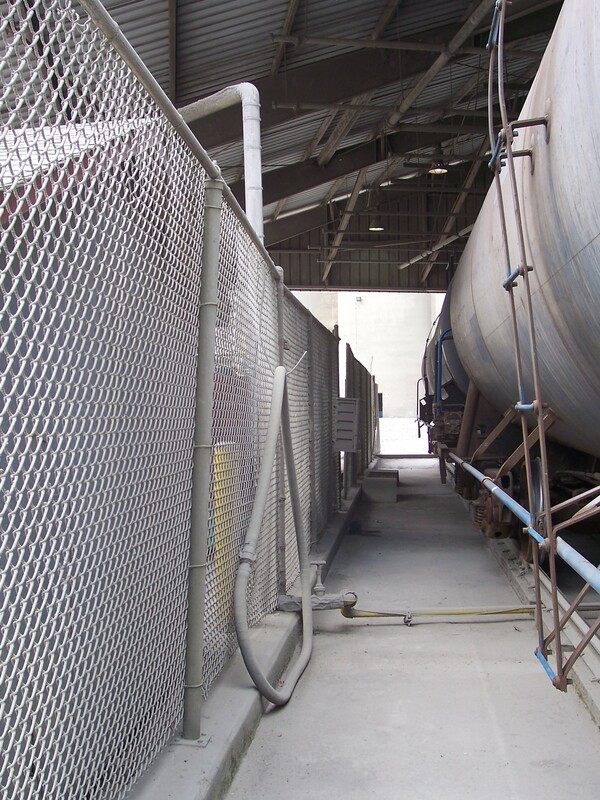 This show a chain link fence installed on the retaining wall surrounding the Kohl’s department store. 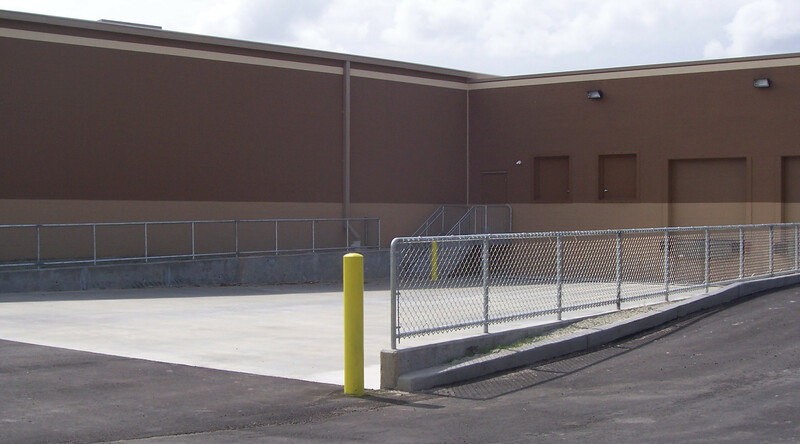 Note also the heavy duty bollards to protect the curbing and wall from large trucks backing up. 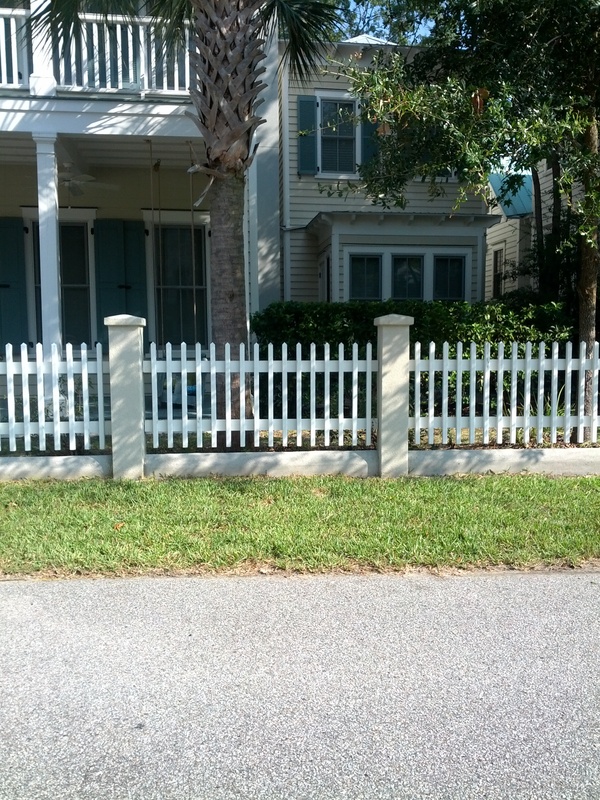 This picture shows a mixture of types of fences available – 6’ privacy in the background and the 4’ picket around the driveway. Surrounding apartment pool complex in Mt. Pleasant, SC. 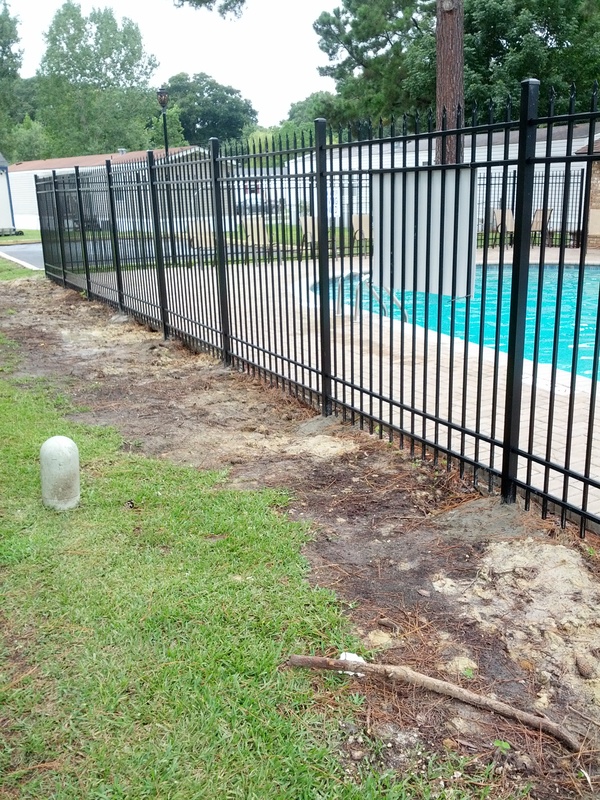 AAA Fence works in concert with pool companies to coordinate fence construction to ensure safety and a seamless opening date. 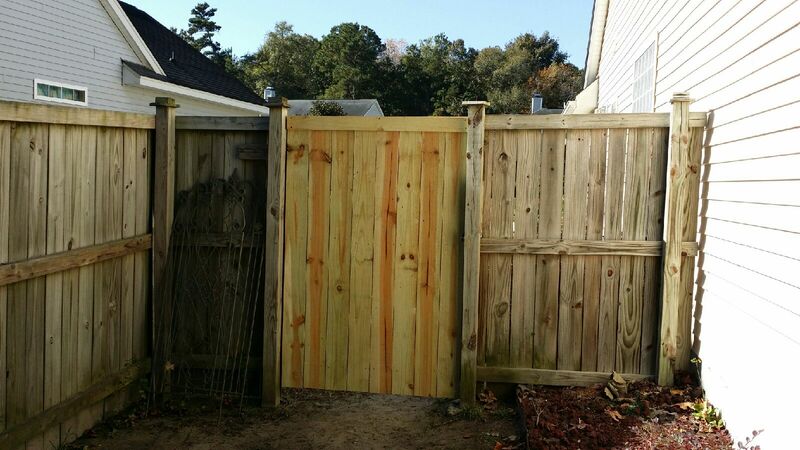 This Ladson customer called to let us know their gate for their 6’ privacy fence ‘wasn’t working’. 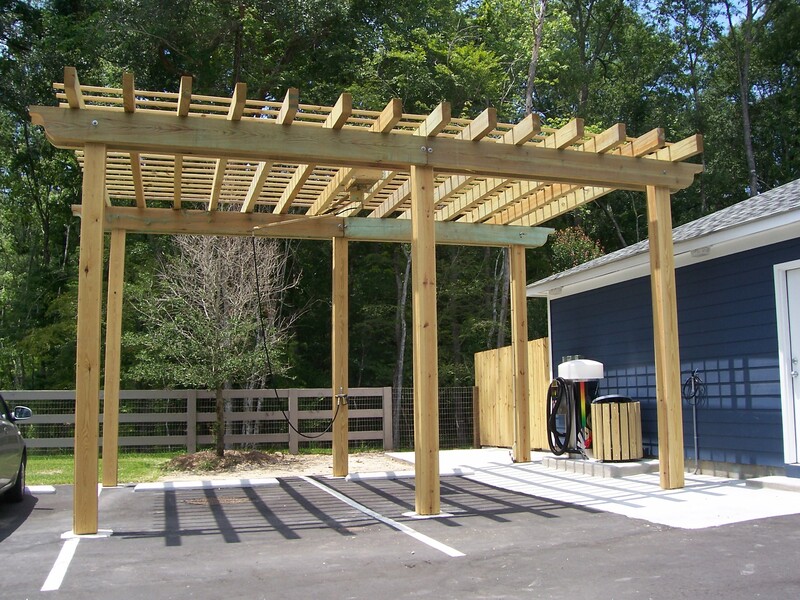 We build the best and repair the rest. 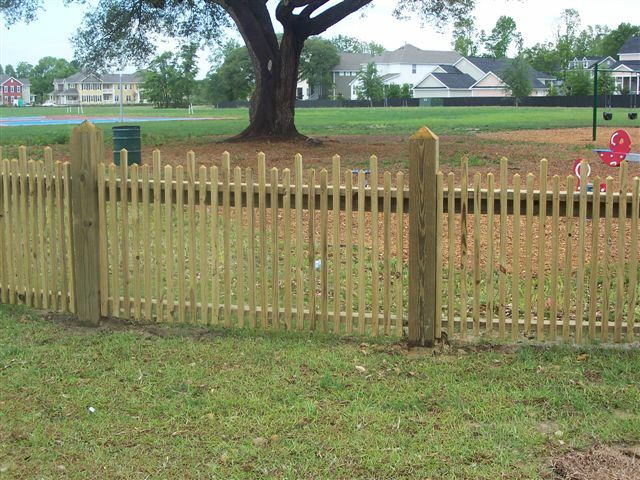 You can be the talk of the neighborhood with a fence like this! 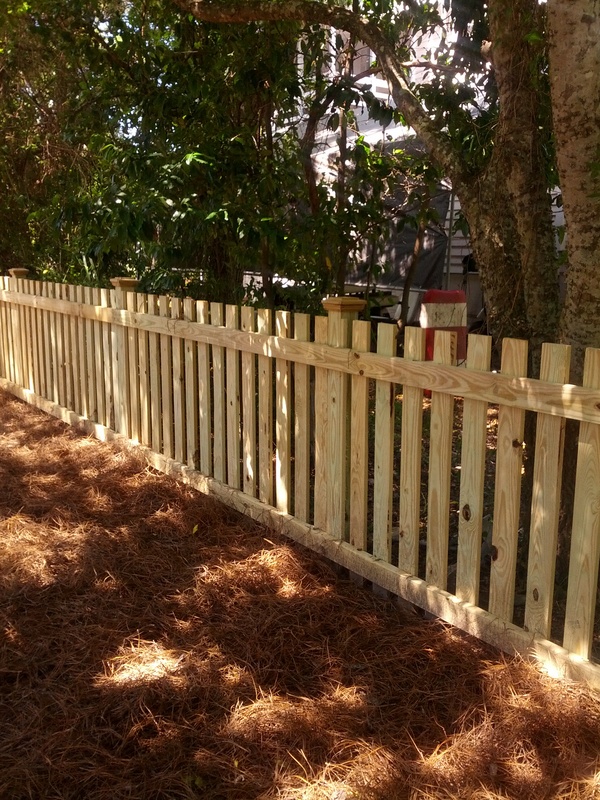 Every piece of this fence was custom cut buy the talented crew at AAA Fence. Imagine looking out your backyard and seeing this beauty. 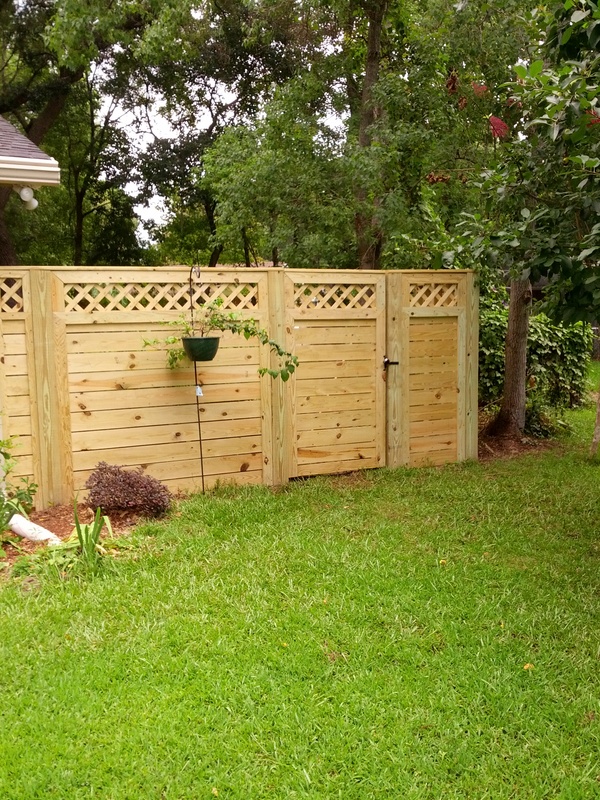 Post exposed 6×6’s, 1 x 6 rough sawn boards lay horizontally and then lattice mounted to the top. 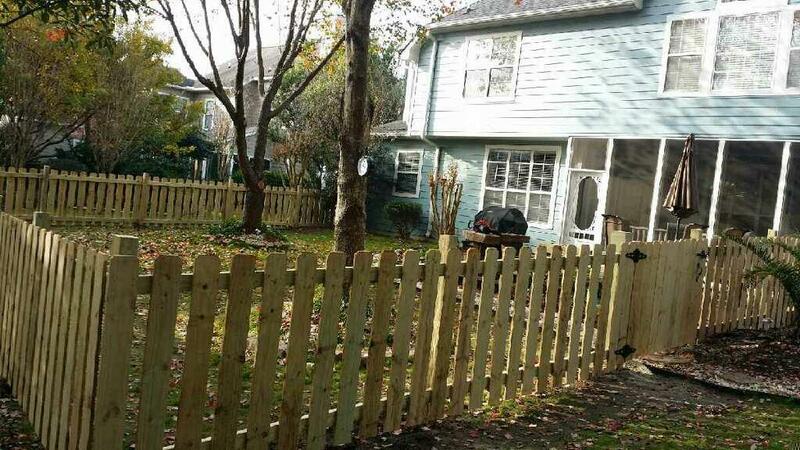 You have the option with some of the styles of aluminum fences we offer to add on a ‘puppy picket’ to keep your small and newborn dogs inside your yard. 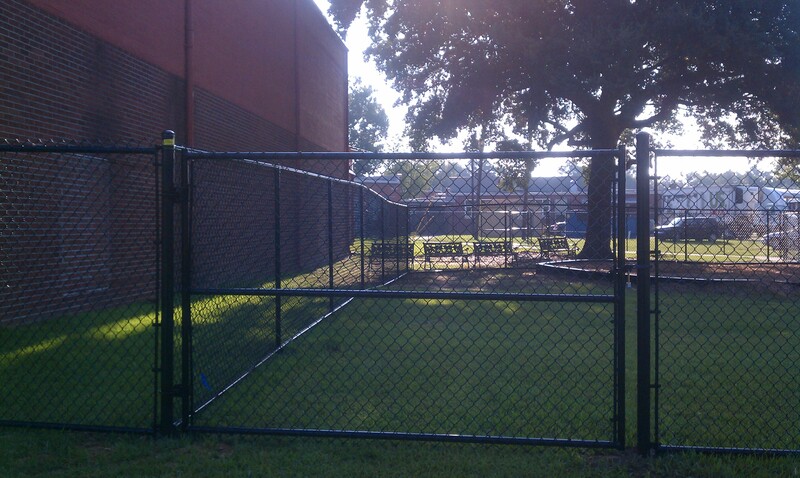 This chain link fence surrounds the Brentwood Middle School playground. 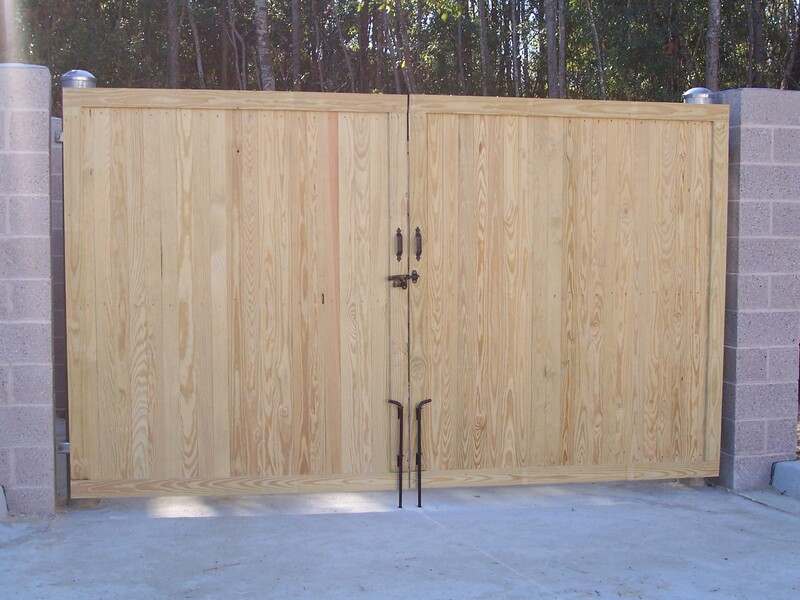 Believe it or not this beautiful wooden gate was created for a commercial application to enclose and allow access to a dumpster. Out of sight, out of mind. 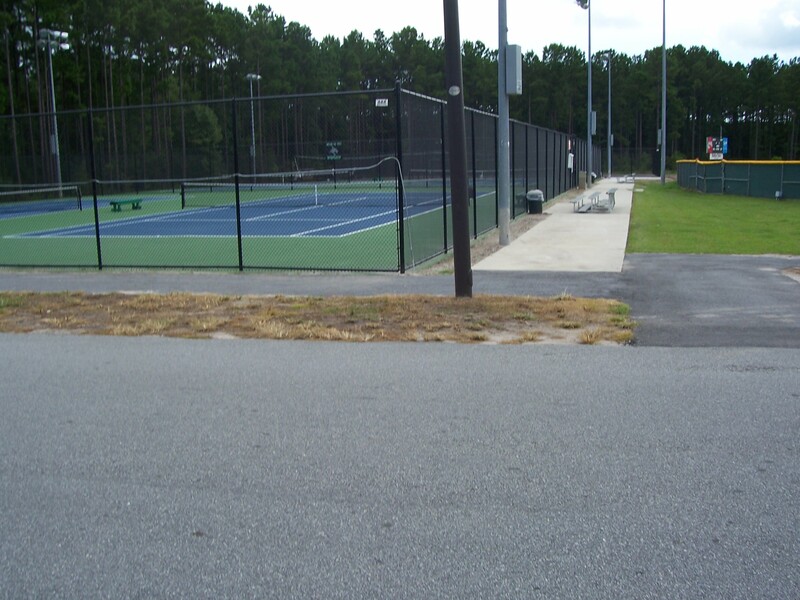 This chain link fence surrounds the tennis courts. When our customer in Mt. 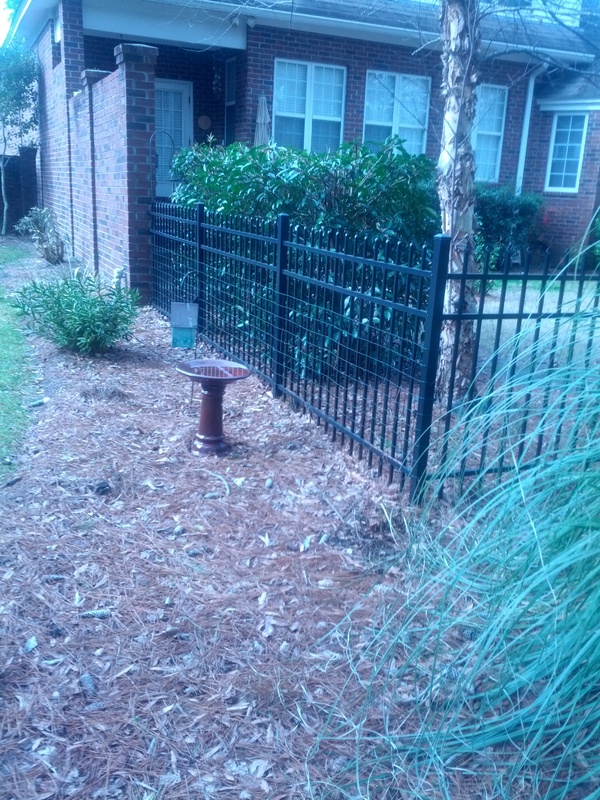 Pleasant called us complaining about deer invading their garden….. 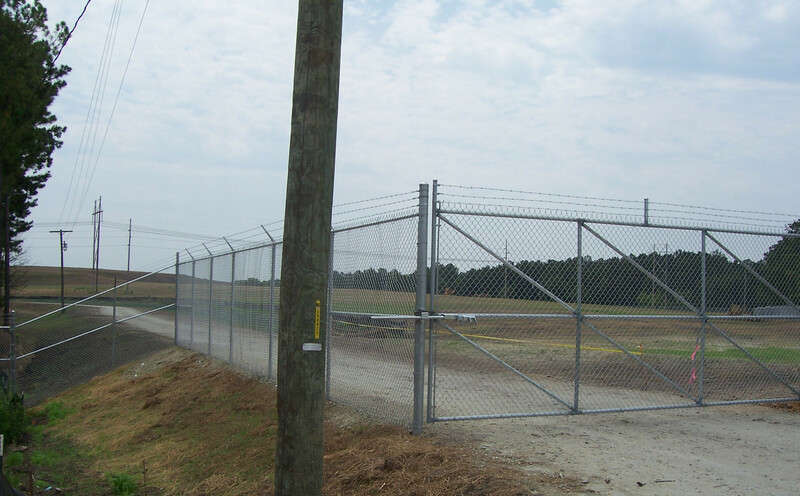 This picture shows heavy duty fence with a large roll gate for security purposes. 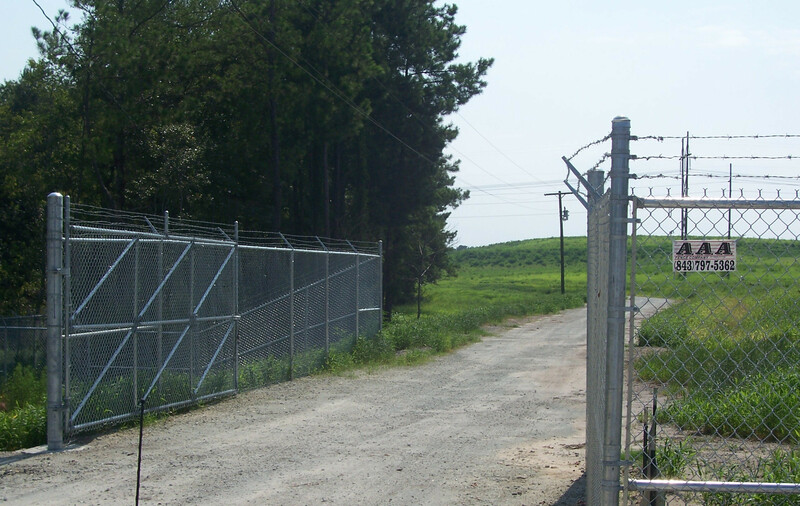 Note the heavy use of barb wire and razor wire – hard to penetrate this location. 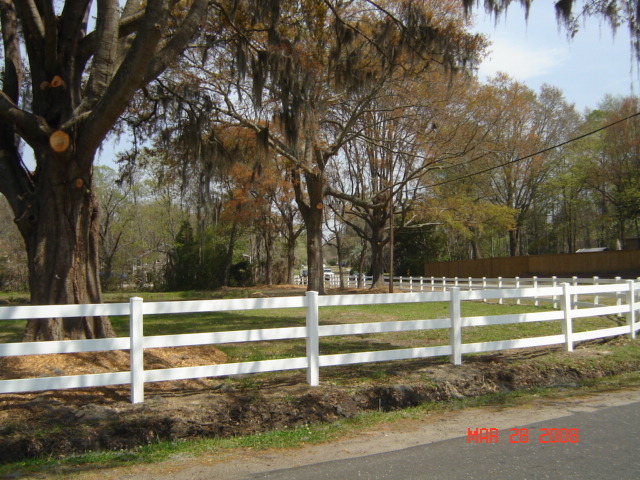 This fence can be found on the outskirts of Hanahan. 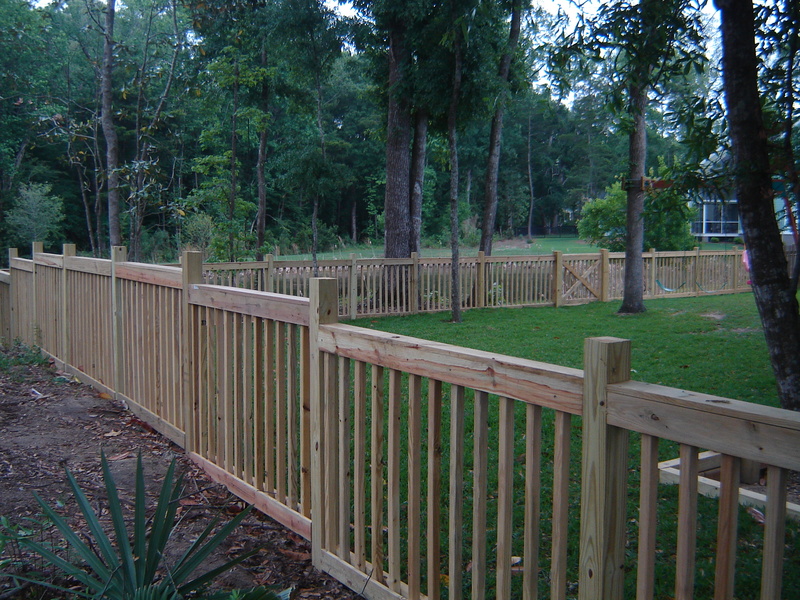 It is a 3 rail vinyl ranch rail fence surrounding a large lot. 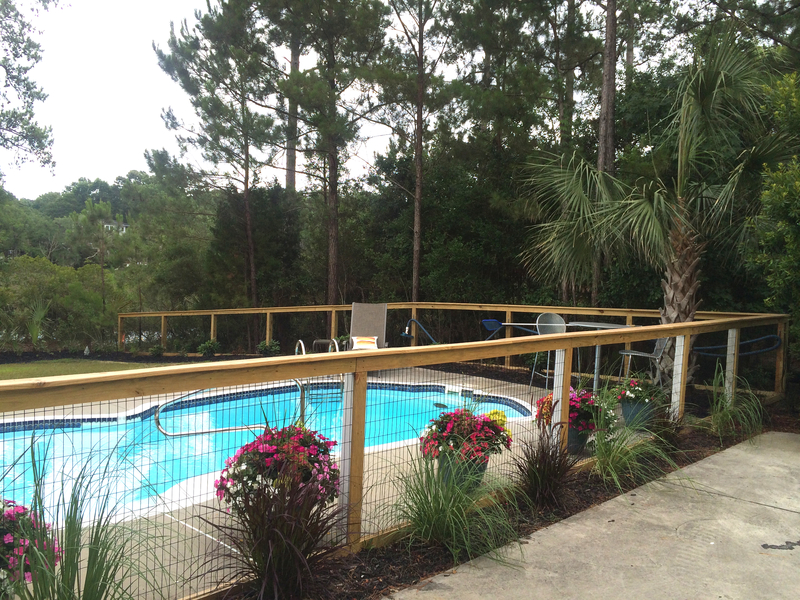 This fence will stand the test of our lowcontry weather – vinyl is maintenance free and holds up for years to come. 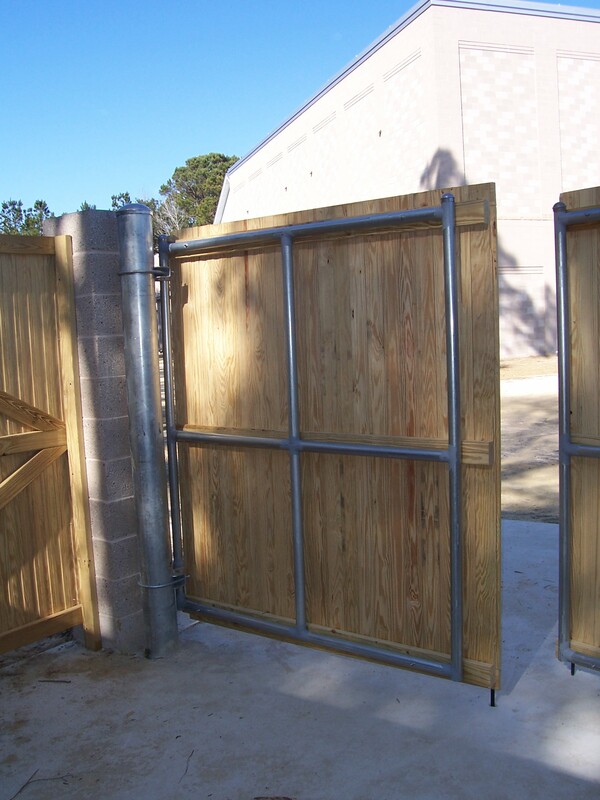 This picture shows the inside of a dumpster pad with metal frame gate on 6 5/8″ posts. 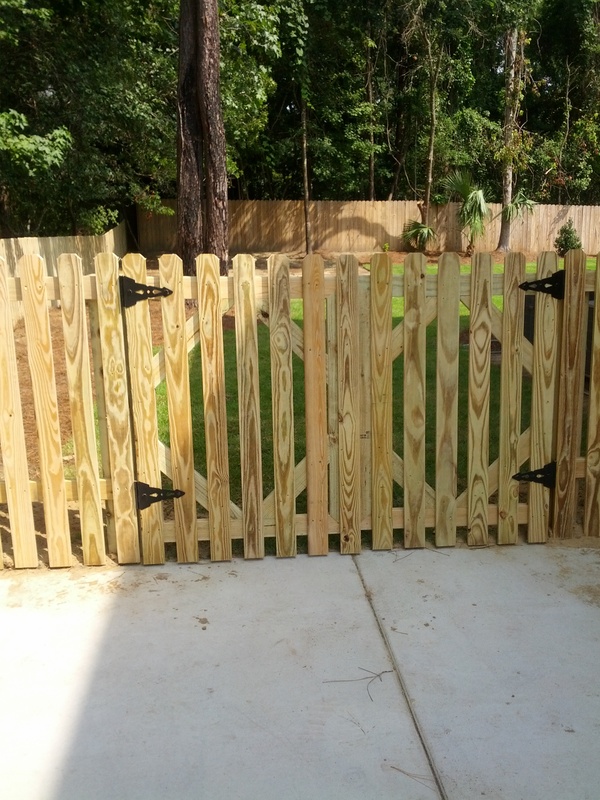 We weld these frame in our shop according to dimensions of the gate…..holds up much better than wood posts and wood frame. 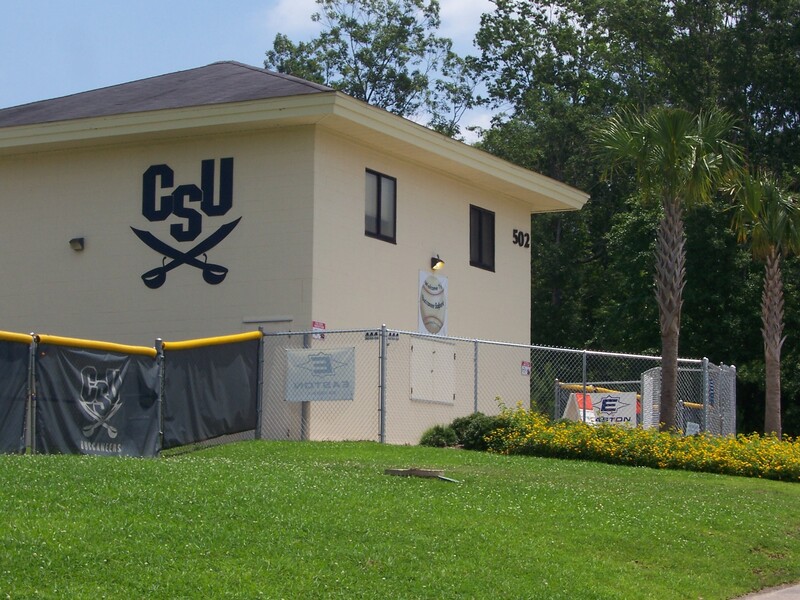 This arbor was built at the Apartment Complex – The Windsor Club off Dorchester Road in North Charleston at their car wash.
Backstop at Joe Riley Stadium – A beautiful picture of picturesque Joe Riley Stadium in downtown Charleston. 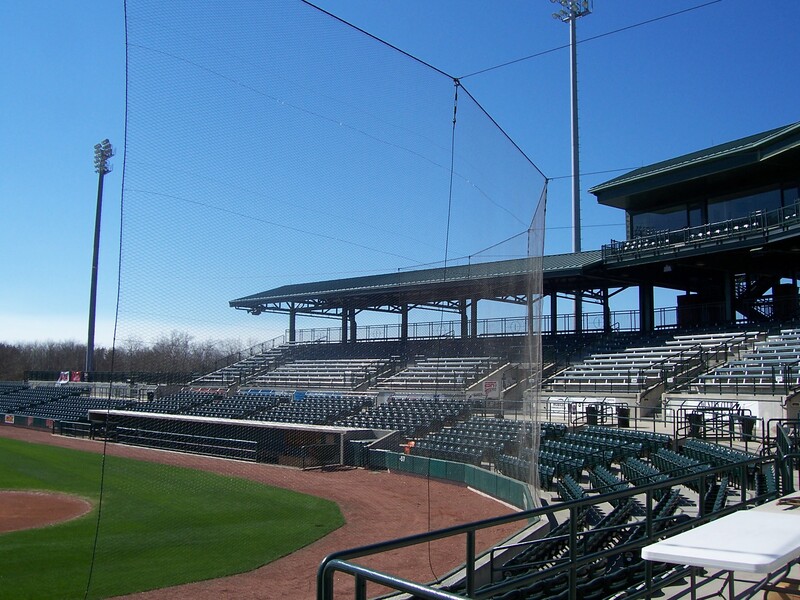 AAA Fence installed the netting for protection of the stands for the Riverdogs, Citadel baseball games and other special events.